Do We Have the Actual Words of Christ in the NT? Missionaries often claim that Jesus said x or said y in the New Testament. I have seen you say that the NT does not contain the actual words of Jesus, is this a Muslim claim? Scholars have for a long time recognized that the Gospel writers shape their narratives, including the sayings of Jesus. A comparison of the Synoptics reveals this on almost every page. Matthew quotes Jesus differently than Mark does who quotes Jesus differently than Luke does. And John’s Jesus speaks significantly differentyly than the Synoptic Jesus does. Just consider the key theme of Jesus’ ministry in the Synoptics: ‘the kingdom of God’ (or, in Matthew’s rendering, often ‘the kingdom of heaven’). Yet this phrase occurs only twice in John, being replaced usually by ‘eternal life.’ (“Kingdom of God” occurs 53 times in the Gospels, only two of which are in John; “kingdom of heaven” occurs 32 times, all in Matthew. “Eternal life” occurs 8 times in the Synoptics, and more than twice as often in John.) The ancient historians were far more concerned to get the gist of what a speaker said than they were to record his exact words. And if Jesus taught mostly, or even occasionally, in Aramaic, since the Gospels are in Greek the words by definition are not exact. A useful distinction is made between the very words of Jesus and very voice of Jesus, known as ipsissima verba and ipsissima vox, respectively. Only rarely can we say that we have the very words of Jesus, but we can be far more confident that what is recorded in red letters in translations is at least the very voice of Jesus. Again, if ancient historians were not as concerned to get the words exactly right, we should not put them into a modernist straitjacket in which we expect them to be something they were never intended to be. – Source. It is very difficult to claim that a quote belongs to the second category of ipsissima verba, that is, verbatim speech. Scholars differ on the very few instances where they believe Christ’s true speech may have been recorded. There is very little general agreement regarding these instances and each case needs to be inspected and qualified critically. Additionally, since we do not have the original words of Christ in their original language, there exists a difficulty in translating where language devices have been used. As such, this matter of a different language, after already being re-interpreted by someone other than Jesus makes the matter of knowing what Jesus actually said quite complicated. This is especially true in places where we have single quotes attributed to Jesus, without any other witnesses. How would we know that the one listening and recording, understood what was said? There is no way to know. Therefore, the next time a missionary claims to have the very words of Christ, you may want to point out that this is historically untrue and that the quote itself requires extensive examination before qualification. I disagree. I think we *do* have some of the actual words of Jesus, in Aramaic, in the gospels. And taking the hand of the child, he said to her, “Talitha koum”, which is translated, “Little girl, I say to you, get up”. I see no reason why these words could not be the actual words of Jesus. Many scholars think this too. ‘And looking up to heaven, he sighed and said to him, “Ephphatha”, which is ‘be opened’. I don’t disagree that we don’t have some of the original words of Jesus. It is possible that we do. That’s why I used the term “majority”, which denotes a minority. While I am more inclined to the words where Jesus raises someone from the dead, that is mostly due to my Islamic beliefs. Historically speaking though, just because some quotes are in Aramaic, does not necessarily make them historical. As for the historical Jesus claiming to be forsakened, I am doubtful that a Prophet of God would so brazenly reject and doubt God’s mercy and qadr for them. bro , you are right . is the best mark could do is quote gibberish aramaic in 1 or 2 places? aba bro? elo elo lamo… ? because of no chain of narration how do we know that it isnt from 1st century christians ? Psalms 37:25 ….I also aged, and I have not seen a righteous man forsaken and his seed seeking bread. Heathcliff, the field of New Testament scholarship has developed a number of sophisticated criteria for sorting out material in the gospels that might be secondary – ie a product of later Christian tradition – and that which may well come from Jesus. This is what puzzle me ever since I became interested in religion. Where can find we the actual sayings of Jesus ? I consider the greek text in NT just to be the translation of what 1st century hellenised people heard of actual oral tradition of the sayings of Jesus and in must be in Aramaic (It is scholarly consensus that Jesus (p) and his disciples native language was Aramaic, the common language of Judea in the first century AD. The fact that there are remnants of Aramaic phrases and sentences in the gospel could be an indication that oral tradition did exist. The greek, roman christian tradition is just the breakaway of this semitic tradition. I am fascinated with scholarly approach in Qur’an studies which have now taken a direction in the understanding of the Qur’an. Some scholar see that the Qur’an had actually established common understanding of christianity specifically through the Aramaic gospel oral tradition in its milieu: this could be the monotheistic literary genre which Qur’an having conversation with. And that could explain why many of the Qur’anic terms find parallel with some of the surviving gospel fragments preserved in christian Palestinian syro- aramaic dialects. 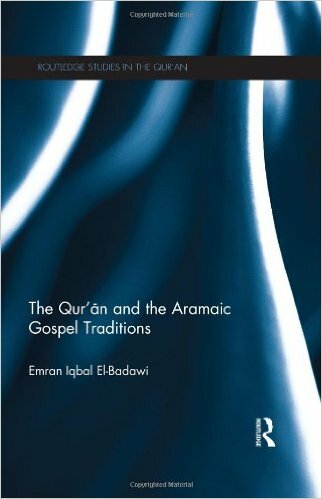 I read the work of one of the leading scholar on this genre: Professor Emran El -Badawi on this topic: he argue that the Qur’anic revelation is actually a dogmatic re-articulation as well as responses to audiences familiar with aramaic tradition in the arabian peninsula. Reading this fascinating book makes me more convinced that the Qur’an is a divine plan whose one other purpose is conveying christology to aramaic audiences (which I believe goes back to genuine gospel of Jesus oral tradition, now considered lost by majority of scholars) which at that time, the dominant culture in the middle east. Why Arabic replaced Aramaic in very short period (less than a century) in the middle east? Glimpse of history before Islam shows that Aramaic is the dominant culture in the middle east. I imagine if genuine gospel of Jesus in Aramaic oral tradition audience ever existed and that the Qur’an was actually revealed to have conversation with those audience, this makes a perfect sense to me, that the Qur’an actually serves as the continuation of genuine monotheistic tradition from Jesus (p) in Aramaic. Most of those audience understood the christology and the message of the Qur’an and then adopted sister language Arabic as their new semitic tradition.